Well after about two years we've finally been contacted about a give-away. That's right friends, we're stepping into the big leagues. I feel like this is going to be the tip of an iceberg of free schwag for our favorite readers. Now I know what you're thinking... "but Chef Fresco, this isn't even foodie related." Well, we know but 50 free brochures is still pretty awesome! And all you have to do is leave a comment. Just think of how impressed your friends will be at your next dinner party when you whip out your brochures highlighting all of your culinary skills before you serve them. They'll be begging to come back again. That's just one idea, though you can print what ever you like. And on a side note if you need someone to design them just contact me and I will be glad to help you out =). The deal is put on through UPrinting.com. All you have to do is leave a comment below. We will be using random.org to pick the winner this Friday, August 19th at 1pm EST. Best of luck! If you're the lucky winner, you can check out their print brochures and brochure templates for ideas. 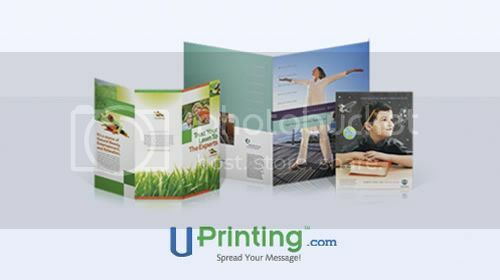 This giveaway is sponsored by UPrinting.com, an online printing company and no monetary compensation was given and I will receive brochure printing services for hosting. Prize only available to individuals who have not already won the same print giveaway in the past six months. You also must be a U.S. resident. Pick me! All the food shots on the right are making me hungry for lunch ... I think I may have to buck up and try a recipe of yours this week. Thanks for sharing!